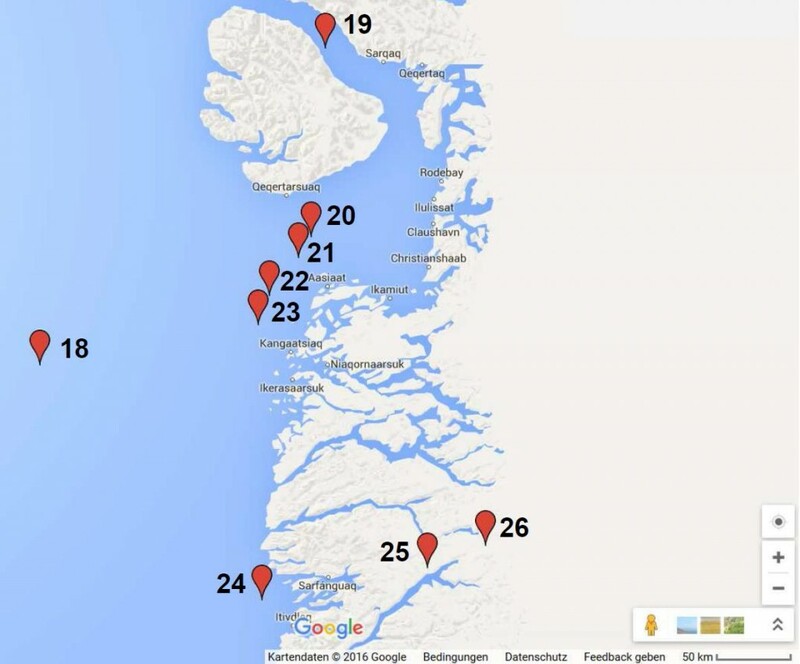 Geologist Dr. Sebastian Lüning and Prof. Fritz Vahrenholt have been busy mapping the Medieval Warm Period using Google as a tool. Lately their focus has been on a number of studies examining temperature reconstructions from the Baffin Island and Western Greenland. This focus has been in part in response to a recent paper by Nicolás Young, a glacial geologist at Columbia University’s Lamont-Doherty Earth Observatory, which claimed with “great clarity of evidence” that the Medieval Warm Period did not exist globally and that it was a “patchy” phenomenon at best. Lüning’s and Vahrenholt’s spent three weeks examining Young’s paper and many others from the region. Their conclusion: Young’s paper is ripe for the dustbin. Figure 1: Chart of studies with results of the Medieval Warm Period (MWP). The numbers refer to the sequence of the discussion in the text. Red points indicate MWP was warm, blue points show it was cold. See the interactive Google Maps map here. Because time is short, I’ve translated only the summaries. All the abstracts of the more than 2 dozen papers presented are in English at Lüning’s and Vahrenholt’s post, which I’ve linked to above. 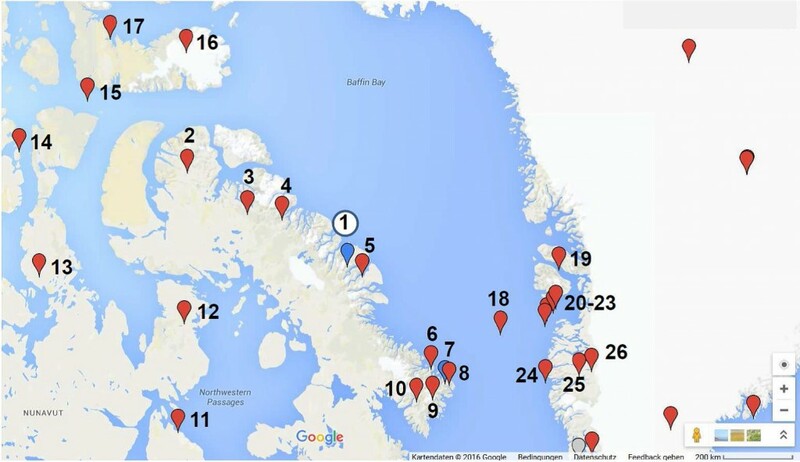 In the North Canadian Arctic, the situation certainly appears to be clear: The MWP is described in numerous studies. Only 2 of 16 glacier studies (among them the one from (Young et al. 2015) show MWP glacier advances, which likely was a local phenomenon, e.g. caused by heavy local snowfall. Figure 2: Chart of studies with results of the Medieval Warm Period (MWP) – Close-up of Greenland’s west coast. The red markers indicate a warm MWP, the blue ones indicate it was cold. See the interactive Google Maps here. In Western Greenland all studies show that the Medieval Warm Period was in fact warm. Moreover not only does Lüning’s and Vahrenholt’s comprehensive Google Maps-based survey show that the Medieval Warm Period was real in the Arctic, but that it was clearly a global phenomenon as well. Speaking of Greenland Temperatures, there is a station we know of, on the Coast in the West, where it seems that the bottom fell out, and their temps fell dramatically as recorded here. And, the last I checked, it’s still down. That’s the most dramatic temperature drop for any location that I could find. Usually what one finds are some very slow increases (probably due to UHI effect) or decreases, at most. I wonder if Wolfram Alpha’s compilation of temperatures (mostly for cities and airports because of it’s sources of data) might be in any way helpful to them as a source of what appears to be raw data. The thing I find weirdest of all is how pleased they are to tell us the medieval warm period was patchy, and not worldwide, so it didn’t exist, but the current putative warm period is patchy and not worldwide, but that’s what we have to expect from global warming. I think—now, I’m just guessing, mind you—that it’s called selective vision and memory, if it’s done unintentionally. If intentional, then, what is the term? Oh, yes: HYPOCRISY! The ghost of Mann’s hockey stick has been killed off long ago but there is still the odd attempt at resuscitation. There’s a chance we’ll get continuous spectrum light sources again.